If you’re looking for a great beach party film this summer, there are a ton that you can find throughout the history of film. Of course, Lagoona Gator at Typhoon Lagoon may have another suggestion worthy of your summer viewing. 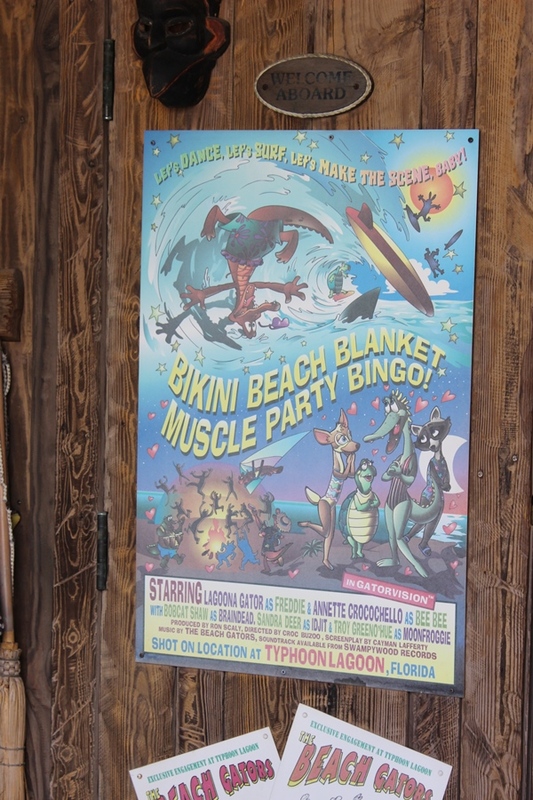 If you stop by his hangout, the Board Room, he may not be available but you can check out his decorations; including this poster for Bikini Beach Blanket Muscle Party Bingo, that was apparently shot on location at Typhoon Lagoon. If the name sounds familiar, there is a good reason for that. Bikini Beach Blanket Muscle Party Bingo is playing with the titles of American International Pictures’ (API) beach party films. Credited with creating the genre, not all of API’s films included beach themes, but much of the cast appeared throughout the film series, although they played different characters on rare occasions. Other studios would attempt to create films within the genre, but no one seemed to be able to capture the magic of the API films. What is or isn’t considered a part of the series is debatable, but a case could be made for the following films: Beach Party (1963), Muscle Beach Party (1964), Bikini Beach (1964), Pajama Party (1964), Beach Blanket Bingo (1965), Ski Party (1965), How to Stuff a Wild Bikini (1965), Sergeant Deadhead (1965), Dr. Goldfoot and the Bikini Machine (1965), The Ghost in the Invisible Bikini (1966), Fireball 500 (1966), and Thunder Alley (1967). From this list it is easy to see where Lagoona’s film took its inspiration. This wouldn’t seem to have a direct tie to Disney, but you have to look no further than the second billing on the poster to find that connection. Annette Crocochello, starring in the role of Bee Bee, is a clear connection to Annette Funicello, and her character in the series, Dee Dee. Annette was a household name by the 1960s thanks to her work with Disney, and was currently under contract with Disney when Beach Party’s director, William Asher, decided he wished to have her in the lead role. A full script wasn’t available for Walt Disney to sign off on, but an agreement was struck that the film would be entirely family friendly, and thus not tarnishing Funicello’s image, nor Disney’s by association. Funicello would go on to star in 10 of the series 12 movies. Much of the other cast of Bikini Beach Blanket Muscle Party Bingo can be tied to counterparts in the films series, such as Lagoona Gator himself plays the part of Freddie, who is an obvious connection to Frankie Avalon’s Frankie. However, when it comes to music, the ties to API’s series start to drift a little. The songs in the film are the creation of The Beach Gators, Lagoona’s band that is a clear stand in for The Beach Boys. Meanwhile, the soundtrack is available from Swampywood Records, which is a play on Disney owned Hollywood Records. Neither The Beach Boys or Hollywood Records were tied to the film series, but the lines are clearly drawn for both connections. There are a ton of details hidden throughout Lagoona Gator’s Board Room, from his time as a surfer, to his musical career, and even a bit about his personal life. Meanwhile, on this side of the Lagoona Gator cinematic universe, there are plenty of real life beach party films to fill up your summer with! No matter if you’re hitting the waves of Typhoon Lagoon or curling up with the air conditioning and a beach blanket in your living room, make sure it’s a party!